I'm going to try to deal with the general backlog of music with a "Record Roundup" of quick(er) takes from time to time. Here, the operating principle is to cover number of good American (but not necessarily Americana) releases that have come over the transom in the last few months. From veterans to new blood, there's a lot to feast your ears on if you follow up. Chris Maxwell - Arkansas Summer Chris Maxwell has been hovering in my peripheral vision for quite some time as a tangential member of the Holly Miranda universe, along with Ambrosia Parsley. Those planets aligned at Hell Phone last month when Chris and Ambrosia opened for Holly's solo set, and also provided some backup as needed, on guitar and vocals. I liked Chris's flexible voice and wry way with a lyric, as well as casual mastery of a variety of rock forms. While Arkansas Summer is his debut solo album, I wasn't wrong about the mastery as Maxwell has been in the game since the 90's, when he was a member of Skeleton Key. Self-produced, but ably supported by such Woodstock-area compadres as Phil Hernandez, Marco Benevento, Amy Helm, and Parsley herself, Maxwell pursues fun and introspection while channeling Wilco, The Beatles, and other Anglo-American avatars in fresh combinations. His songwriting is honed to a fine point throughout, but standouts such as Have You Ever Killed Yourself, Imaginary Man, the title track, and Devil Song might convince you the most quickly. His smarts are not only musical; check out the lyrics of the acoustic-driven Things Have Changed For Me: "Allies to enemies/Alibis to apologies/I burrow like a bullet in these complicated strategies/I make promises no one could ever keep/I make mistakes I'm doomed to repeat/Never been called lucky, never had a lucky streak/But things have changed for me." They can for you, too. Ocean Music - Songs From The City When I saw Ocean Music at the Knitting Factory recently, it was an explosive update on Replacements-Pixies-Van Morrison, with interlocking guitars, pummeling rhythms, and songs that were sometimes concise and sometimes took their sweet time. So clearly singer, songwriter, and guitarist Richard Aufrichtig has already shifted from the beautifully atmospheric acoustic folk epics on this EP and the self-titled one that proceeded it in 2014, but they're a place to start. And start you should, because Aufrichtig has lived a few lives already and is more than willing to sing about all he's seen and experienced. Catch up, then catch them live - can't wait for the next show. Cory Taylor Cox - Extended Play Like Richard Aufrichtig and Ocean Music, Cox has taken a winding road to get to this place, which is a good and gritty spot to be, with soaring guitars, homespun vocals and solid song structures. Americana with the occasional touch of glam, he could tour with Phil Cook and no one would complain. Keep an ear in his direction. Sonya Kitchell - We Come Apart If you're like me, you took note of Kitchell's protean abilities when her debut was released in 2005, but then lamented how quickly she was absorbed into the coffee house-TV series industrial complex. She's been through changes since then, especially during the eight years since her last album, and We Come Apart feels like a new beginning. She's more willing to push her voice now and is remarkably comfortable in the variety of settings, from embellished folk to torchy soul, she's assembled here. Reintroduce yourself - you'll be glad you did. Max Jury - Max Jury Just 21, this three-time Berklee dropout is obviously a huge talent. He's put together a set of songs that mine the history of rock, soul, and folk with surprising musical maturity and that are well-served by this expansively produced debut. But there's also a little of a portfolio feel to the collection: "Look what I can do!" Hopefully he'll find the time, like Sonya Kitchell, to fully grow into his gifts. This album will make more than pleasant listening while we wait. 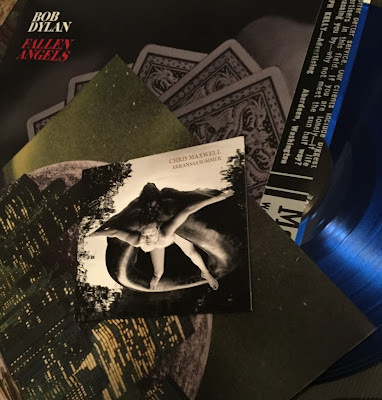 Bob Dylan - Fallen Angels These Great American Songbook collections may be somewhere to the side of Dylan's overall project, but there's still a lot to like in them, not least Jack Frost's sparkling production. When is that guy going to work with some other artists? While last year's Shadows In The Night held a consistent mood (perhaps slightly too consistent), Fallen Angels has both more variety and a bit more wit. The twinkle in Dylan's eye is especially evident on That Old Black Magic - he's finally embodying the "song and dance man" he once claimed to be and couldn't seem more delighted. You should be, too. Various Artists - Blonde On Blonde Revisited While Dylan himself is following his nose through the back pages of American song, there's no shortage of other perspectives on his own deathless canon. Mojo Magazine's track record on these multi-artist single-album collections may be varied, but this one, in celebration of the album's 50th anniversary, is a triumph. After the menacing electronica of Malcolm Middleton's take on Rainy Day Women #12 & #35 most of the artists stay in the folk-rock vein while still throwing new light on these familiar songs. In fact, if Blonde On Blonde is feeling TOO familiar this is the antidote. Some highlights are the way Thomas Cohen uses a hooky bass line to add mood to his powerful take on Most Likely You'll Go Your Way And I'll Go Mine, or how Peter Bruntnell drains the sarcasm from Just Like A Woman leaving only deep sorrow, or Ryley Walker's wholly owned Fourth Time Around. And I love the way Michael Chapman (also a 75 year old legend) toys with Leopard Skin Pillbox Hat like a kitten with a ball of yarn. Just as they did with their excellent Physical Graffiti tribute last year, Mojo has produced a special limited edition on ("blonde") vinyl, with some sweet accoutrements. If I didn't already subscribe I'd be ordering that now! Yes, I know, Car Seat Headrest. And Mutual Benefit. More on them next time when we discuss The Best of 2016 (So Far)!